The terminal will have two glass-faced buildings with slanted roofs facing each other. MIAMI — Royal Caribbean Cruises Ltd. will move at least one and probably two of its Oasis-class ships to a new terminal it expects to open in Miami in 2018. Two of the 5,400-passenger ships, Oasis of the Seas and Allure of the Seas, currently sail from Port Everglades about 30 miles to the north. The new Harmony of the Seas will sail from Port Everglades from Nov. 17 to April 18. At an event at the waterside Perez Art Museum in Miami, RCCL chairman Richard Fain announced that the new terminal will be designed by the architectural firm Broadway Malyan of Singapore. He unveiled renderings of the building, expected to be finished by the end of 2018. It is unusual because most cruise terminals are designed by engineers, not architects. “If we had been doing this 10 years ago, we would not have been so ambitious with the aesthetic side of it,” Fain said. But he said Miami has gone through an architectural renaissance. The Perez Art Museum, for example, was designed by the renowned Swiss firm Herzog & De Meuron. 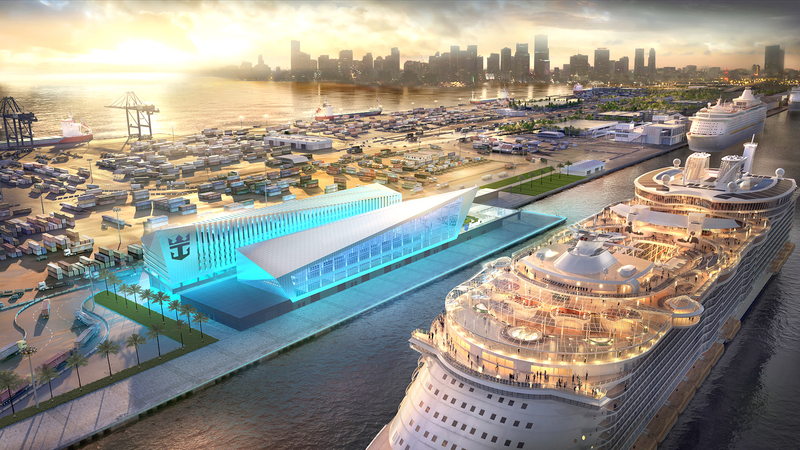 The building will be part of a $200 million investment Royal Caribbean is making to build the terminal, which it will own, on land leased from Miami-Dade County. Fain said the terminal is intended to handle a single large ship at a time, and has room for a ship slightly larger than the 225,000-ton Oasis class. By 2018, Royal Caribbean will have four in the class, including a ship under construction for delivery in 2018. In a coup, Port Everglades in 2010 won the opportunity to be the home port for the first two Oasis ships, Oasis of the Seas and Allure of the Seas. It will now lose one, possibly both, of those vessels. The Oasis of the Seas will sail from Port Canaveral this winter. “This will cement us as the cruise capital of the world,” said Port Miami director Juan Kuryla. He said the terminal is expected to boost the port’s annual traffic from 5 million to 6 million passenger movements and add 1 million passengers a year to RCCL’s current total of 750,000. The new, wider locks on the Panama Canal will open June 26 with the first official transit of a cargo ship, but don’t expect much traffic through them from cruise ships. Only one cruise ship has reserved space to move through the new locks, which are open to one cruise ship a day starting in June 2017, according to the Panama Canal Authority. Princess Cruises’ Caribbean Princess is scheduled to make a series of thirteen 10-day cruises through the canal beginning Oct. 21, 2017. At 118 feet wide, the 3,080-passenger Caribbean Princess can’t fit into the 110-foot locks that were opened in 1914. The new locks had been scheduled to open in time for the centennial but were delayed by disputes between Panama and the consortia of contractors that built them. The new locks rely on tugs rather than electric locomotives to move ships through them. Doubts have been raised about the ability to fit the tugs in the locks along with the longest ships, but at 951 feet, the Caribbean Princess will have room to spare in the 1,400 foot locks. For cargo ships, questions have also been raised about the record-low depths of water in Gatun Lake, which connects locks on the Atlantic and Pacific side of the canal. Depths hit 81.75 feet earlier this year. But large cruise ships typically need only about 30 feet to operate. Most cruise ships transiting the Panama Canal will continue to use the old locks. Cruise lines have several ships operating in Alaska that would need the new locks to move to the Atlantic, such as Royal Caribbean International’s Explorer of the Seas and Celebrity Cruises’ Celebrity Solstice. But for now they are stationed year-round in the Pacific, moving to Australia, New Zealand and the Far East during the winter. A spokesman for Carnival Cruise Line said Carnival doesn’t have any full transit Panama Canal cruises scheduled through April 2018. Holland America Line recently launched the Koningsdam, the first HAL ship that will not fit through the old locks, but it is currently deployed in Europe during the summer and the Caribbean during the winter. Cunard flagship Queen Mary 2 sailed into Southampton early this morning following a 25-day refit costing around £90 million. The so-called ‘remastering’ of the 12-year old ship sees 50 new cabins added, including 15 for single travellers. Ten additional kennels have been added for passengers taking their pets on transatlantic sailings, complete with a lamp post from Liverpool and a fire hydrant from New York to make dogs “feel at home”. The work at a shipyard in Hamburg has seen a redesign and refurbishment of the Queens Grill and Princess Grill suites and restaurants, as well as Britannia cabins, with the remainder of the accommodation to be fully completed by the end of the year, according to Cunard. A new speciality restaurant, The Verandah, has been introduced while the Kings Court buffet area has been completely restructured. The redesign of key public spaces and restaurants includes transformation of the former Winter Garden into the Carinthia Lounge. Queen Mary arrives in Southampton after Major Refit. The ship’s exterior has been repainted, using more than 15,000 litres of paint applied to the hull alone, and “significant technical enhancements and structural changes” have been carried out. More than one million man hours went in to the refurbishment over the 25 days with 55,200 square metres of new carpets laid – the equivalent of 10 football pitches. A total of 4,000 new framed pictures have been brought on board as part of the refurbishment. Cunard senior vice president, Simon Palethorpe, said ahead of the ship departing for New York later today: “Cunard’s passion for delivering a service and experience that both meets and exceeds guest’s expectations is transforming the way we travel by sea.